Chronillogical - Wot’s All This Then! We toyed with the idea of pulling back to reveal Milo’s head rest­ing on a pike, but that would have been 1) pretty morbid and 2) unnec­es­sar­ily ter­mi­nal. Achilles with purple hair? Who knew? a color that is thought to have been dis­cov­ered as early as the era of Alexan­der the Great. 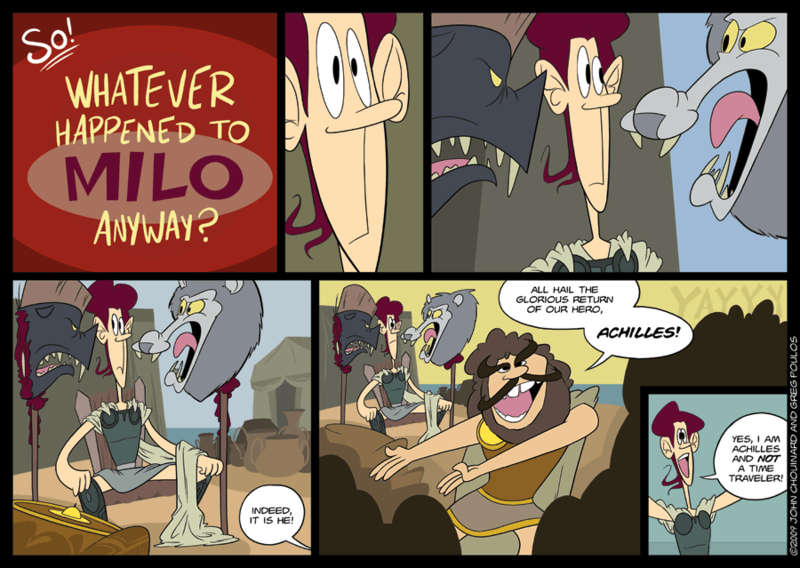 Milo might also just be part murex. Any­thing is pos­si­ble with the power of imag­i­na­tion! I will admit that I did not know about Tyrian Purple before and thought that maybe you were making it up. But it is Real and True! This is a very good tidbit of infor­ma­tion to know. They think he’s Achilles??? Odd…he looks noth­ing like Brad Pitt….